The Clough Center for the Study of Constitutional Democracy will present “The Shadow of War” with Mark Mazzetti, a national security correspondent for The New York Times, on Feb. 26 at 5:30 p.m. in Stokes Hall, Room 195S. 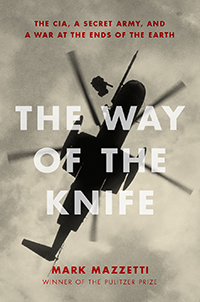 Mazzetti is the author The Way of the Knife: The CIA, a Secret Army, and a War at the Ends of the Earth. In 2009, he shared a Pulitzer Prize for reporting on the intensifying violence in Pakistan and Afghanistan and Washington’s response, and he has won numerous other major journalism awards, including the George Polk Award (with colleague Dexter Filkins) and the Livingston Award, for breaking the story of the CIA’s destruction of interrogation videotapes. Mazzetti has also written for the Los Angeles Times, U.S. News & World Report, and The Economist. His book will be available for purchase at the event. This entry was posted in Guest Authors and tagged Pulitzer Prize winner, war. Bookmark the permalink.